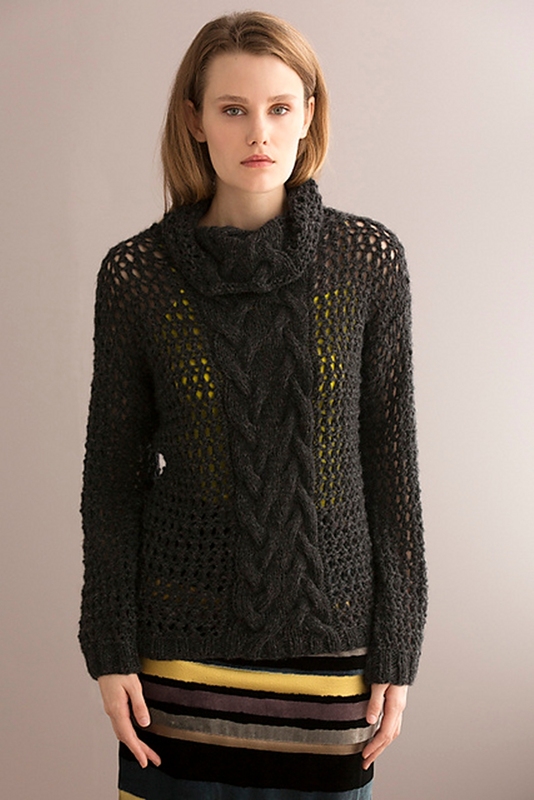 Taken from Tahki: "A cable panel contrasts with an allover mesh body and sleeves in this cowl neck pullover. Light and lofty Tahoe is perfect for this airy look." This pattern is from Tahki Yarns, Life.Style, Fall/Winter 2015. Design by Teresa Chorzepa. Size US 9-16" circular and 9 straight needles (or size needed to obtain gauge), cable needle, stitch markers, stitch holders, and a yarn needle are required but not included. Finished Bust Measurements: 41 (45 1/2, 50 1/2, 55, 57 1/2, 62)"" after blocking. Gauge: 13.5 stitches and 20 rows = 4 inches in Mesh Pattern". Color shown in #08 Ebony.